«©NCSX» When the PC-Engine first debuted in Japan on October 30, 1987, it was priced at a lofty JPY24,800 or US$269.05 as of this morning’s exchange rate. Adjusted for inflation, that’s US$461.46 in 2008 dollars. To target a less affluent customer base, NEC and Hudson released the PC-Engine Shuttle in 1989 at JPY18,800 which shipped with a modified expansion port and wasn’t compatible with the CD-Rom or Super CD-Rom. 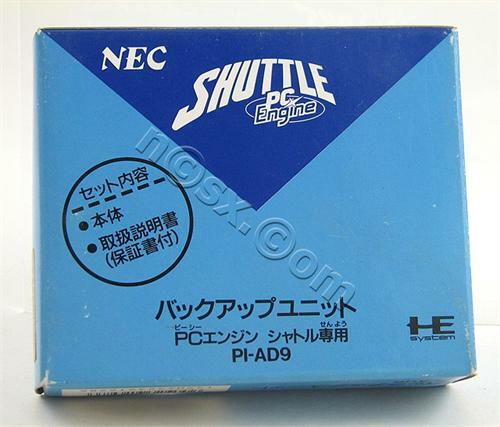 Since ram was prohibitively expensive back in the day, the Shuttle also didn’t have any way of storing save-game data... until NEC released the Shuttle Backup Unit. The unit includes a rechargeable Ni-Cad battery inside. NCS' remaining inventory is brand new and factory boxed. The condition of the cardboard boxes ranges from excellent to mint condition and the units we're selling are from our private collection. Pricing per memory backup unitis set at US$46.90 each. If you reside within the continental US, NCS recommends shipping by USPS Priority Mail for the most economical domestic carriage cost. New and factory boxed PC-Engine Blaster Joypad which was released for the Japanese market nearly 20 years ago. New and factory boxed PC-Engine GT Com Cable which links up two PC-Engine GT handhelds to each other. Whenever we locate old inventory in the dark recesses of the original warehouse, we'll wonder how well the plastic has held up over the years. Sega's conversion of Thunder Blade isn't exactly a 1:1 conversion but it's not too bad. When flying over the buildings in the first stage, every edifice is rickety and the backgrounds are extremely sparse but the game play itself is alright.